"One Voice: Somos Live! 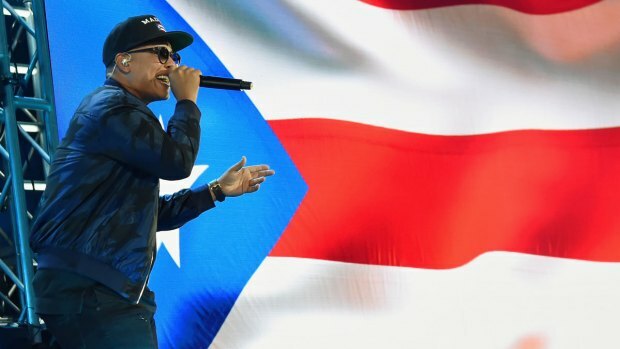 A Concert for Disaster Relief" aired in Spanish on Telemundo and Univision Saturday, Oct. 14, with NBC joining in the third hour to broadcast in English at 10 p.m. ET/PT. It is the first time the rival Spanish-language networks simulcast programming. Anthony performed live from Miami's Marlins Park stadium along with Camila, Gente de Zona, Nicky Jam, DJ Khaled, Magic!, Nacho, Prince Royce, Romeo Santos, Alejandro Sanz, and Daddy Yankee. Lopez also performed live, and host alongside Rodriguez, from an NBC soundstage in Los Angeles featuring Demi Lovato, Maroon 5, Ricky Martin, Gwen Stefani, Stevie Wonder, Chris Martin, Jamie Foxx, Mary J. Blige, Andra Day, Maxwell and Julia Michaels. There were also be special appearances by Christina Aguilera, Lauren Ash, Bad Bunny, Miguel Cabrera, Chainsmokers, Ciara, Sean "Diddy" Combs, Vin Diesel, Howie Dorough, Kenny "Babyface" Edmonds, E-Flat, Ben Feldman, Bethenny Frankel, Selena Gomez, Seth Green, Derek Hough, Vaness Hudgens, Jose Iglesias, John Leguizamo, Kim Kardashian, Heidi Klum, Vincent Laresca, Gabriel Mann, Esai Morales, Andrea Martin, Mark McKinney, Debra Messing, Motiff, Nas, Tyler Perry, Nicole Richie, Gina Rodriguez, Ruby Rose, Zoe Saldana, Anbal Sanchez, Nico Santos, Ryan Seacrest, Jada Pinkett Smith, Joan Smalls, Jimmy Smits, Wilmer Valderrama, Sofía Vergara, Marlon Wayans, Jesse Williams, Susan Kelechi Watson and Russell Wilson. Somos Una Voz is an alliance of artists created by Lopez and Anthony to aid those in need from the effects of recent natural disasters. Funds raised from the telethon will benefit Feeding America, Save the Children, Habitat for Humanity, Unidos for Puerto Rico, United Way and UNICEF.